Chilli rating - mild - 1. Real Thai. Highly versatile. Gluten free. No artificial colours, flavourings or preservatives. 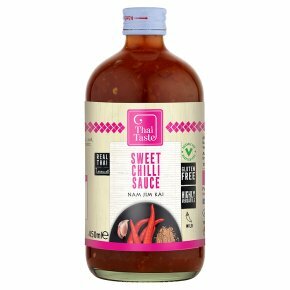 Suitable for vegetarians & vegans.Made from fresh red chilli, this classic Thai sauce has a superbly balanced sweet and hot chilli flavour, rounded with a hint of garlic. A true store cupboard staple, sweet chilli sauce can be used in any dish, in a marinade, or alone as a dipping sauce.